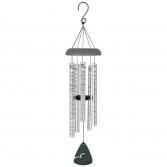 The words to Amazing Grace adorn this large, beautifully tuned wind chime comes with a metal display stand. The words are etched onto the wooden sail and laser stamped onto the chimes themselves. Has a wooden striker and hanger with a metal hook. 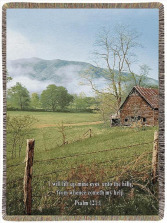 This is a thoughtful keepsake gift for a funeral or memorial service. Would you like to add a beautiful spray of silk flowers to the top of the stand? Select the option for upgrade at $149. Ordering Options: Chimes alone, gift wrapped and delivered $89 Chimes on a display stand suitable for the home or a funeral home $109 Chime on a stand with silk flowers $149 Chimes measure 38" tall. The stand is black powder coated metal with a round base and is approximately 50" tall. Memorial wind chime features the words of the 23rd Psalm printed on each tube. 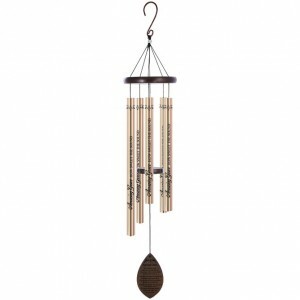 These beautifully tuned chimes are 30" long overall and are delivered on a 50" black metal stand. 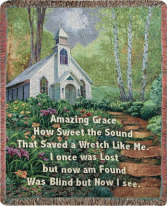 Thoughtful gift for a funeral or memorial service. Ordering Options: Wind Chimes Gift Wrapped and delivered - $59 Wind chimes on a display stand - $79 Wind Chimes on a display stand with an arrangement of seasonal silk flowers All aluminum construction for indoor or outdoor use.